W. D. Zwicky is my uncle Walter, the son is my cousin David. And we’re all proud of what David has done with the company. Family farms were already doomed, and Walter (with David’s help) soon branched out. They built a sizable pond, and later started a rock crushing and gravel business. David bought a backhoe at age 14 and started an excavating company, then shifted to processing tree stumps and wood brush, which led to the current company. (You will note that David was essentially working full-time while going to middle school. Farm families work hard. David did go on through school, and many years later served on the school board for the district. Farm families are woven into their local communities.) David still lives on the old (vastly altered, I assume) farmstead in Robesonia. Growing up on a farm, David Zwicky learned that in nature, there is no such thing as a waste stream. 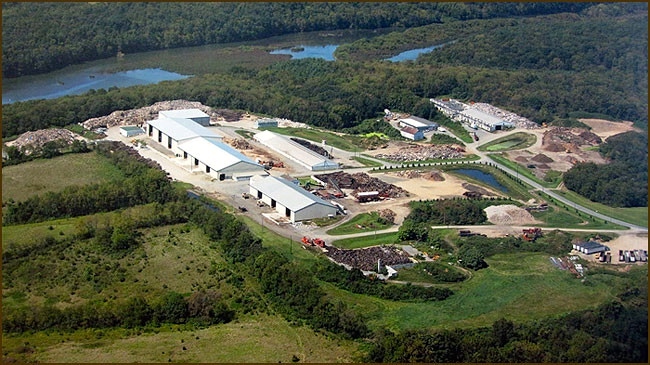 After starting an excavating business in his hometown of Robesonia, Pennsylvania, Zwicky changed gears and founded a wood recovery and processing operation in 1989. The business [Zwicky Processing and Recycling (ZPR)] is owned and operated by Zwicky’s family, with his son Chris in charge of land clearing, his daughter Jodi heading up sales, and his wife Mary the secretary and treasurer. From land clearing to bulk reduction to site remediation, Zwicky coordinates the different facets of the operation to complement each other and make end products from virtually every material encountered. Our company specializes in reclaiming waste materials, and recycling these materials into engineered alternative biomass fuels. Like his father before him, David has always tended towards the laconic. But his company can do the appropriate tech talk. Robesonia is a borough in Berks County, Pennsylvania, United States. The population was 2,061 at the 2010 census. Once famous for its iron furnaces (c. 1794-1927), the town was founded in 1855 by Henry P. Robeson, who had acquired existing iron manufacturing operations and founded the Robesonia Iron Company in 1845. The town is now supported by large industry. Several of the largest employers include C&S Wholesale Grocers, a food distributor, Magnatech International, and Snap-On Tools. The town is also famous for its Pennsylvania German-style pottery, also sometimes called redware. 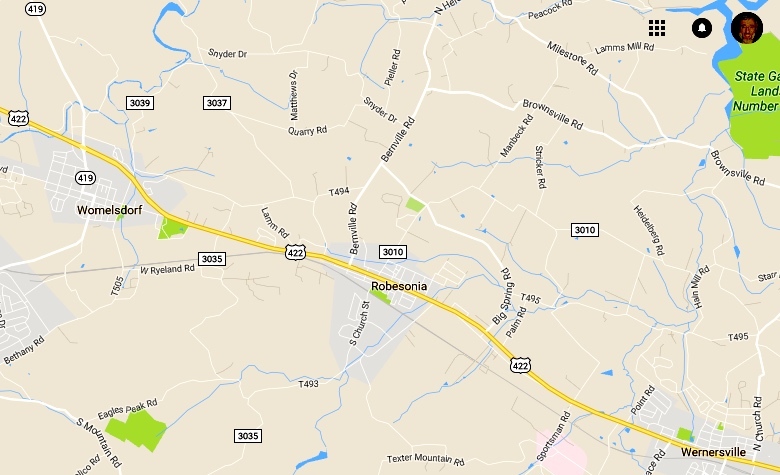 The Robesonia area is served by the Conrad Weiser Area School District [the district David served on the board for] and Conrad Weiser High School. U.S. Route 422 (Penn Avenue) [the successor to an old post road from Philadelphia west to Harrisburg] runs through the borough, leading east 11 miles (18 km) to Reading and west 15 miles (24 km) to Lebanon. Penn Ave. goes west from Reading, though West Reading, Wyomissing (where the Reading Public Museum — see #1 — is, where my father grew up and went to school, and where my grandfather worked, at the Textile Machine Works), West Lawn (where I grew up), Sinking Spring (where my grandparents eventually lived), Wernersville (originally a mountain resort, where I went to summer camp for some years), and Robesonia, and then on further west. The Walter Zwicky farmstead is north of the town center of Robesonia. Fleetwood, also called Schlegelschteddel in Deitsch, is a borough in Berks County, Pennsylvania … The population was 4,085 at the 2010 census. It was home to the Fleetwood Metal Body company, an automobile coachbuilder purchased by Fisher Body and integrated into General Motors in 1931. The name lived on in the Cadillac Fleetwood automobile. In any case, David’s is the truly green branch of the family. This entry was posted on November 20, 2016 at 8:45 pm and is filed under My life, Zwickys. You can follow any responses to this entry through the RSS 2.0 feed. You can leave a response, or trackback from your own site.